Trevor Pateman's Philately Blog: Postally Used or CTO? For many stamp issues, there is an important question which can be asked: Was this issue available at post office counters for regular postal use? This is not a new question. You can ask it, for example, about the first issue of Honduras. But it is not a simple question. For example, we probably have an image of a post office counter. Anyone can walk in off the street, present a letter and ask for a stamp to put on it. If Christmas is coming, they can ask for a Christmas stamp if such things are issued. They don’t have to be a stamp collector to ask for that. But some post office counters are inside exhibitions and congresses where you have to pay to get in or be a delegate to get in. There are sometimes stamp issues which are only available behind a ticket wall. You won’t find them at regular post office counters. But it’s quite possible that someone with real business to transact needs to post a letter at a Congress counter and gets handed the special stamps on sale. So you do get “genuine postal use” even in these circumstances. In the field of Russian area philately, there are plenty of “issues” where it is not entirely clear if and when and where the issue was available. The matter is complicated by the existence of cancelled to order material. Some CTO material is easy to spot but not all of it. In some times and places, stamp dealers have broken up sheets of stamps and put them one by one on plain sheets of paper and got each stamp neatly cancelled at a post office counter. Maybe they borrowed a canceller for the purpose or maybe one clerk had the job of dealing with the dealers. In this case, it is often the case that just one canceller gets used for CTO material and other cancellers for regular letters taken across the counter or brought in from post boxes. So the CTO material can be distinguished. Of course, if sheets are cancelled then if the gum is not washed off it is easy to see that you are dealing with CTO material. But there are more complicated cases. In the case of issues like those of the Northern, North West and Western Armies in 1919 it is really hard to get a sense of how much ordinary business was being transacted at the post office counter and whether these stamps were freely available there. The same is true of some Ukrainian Trident issues and many Armenian Dashnak issues. In contrast, the issues of Azerbaijan and Georgia all seem to have been freely available. The problem of assessing the availability of a stamp is made worse by the fact that at the time – say the 1920s - it was relatively unusual to keep ordinary private or commercial covers – everyone just tore the stamps off. So you may have plenty of what look like used copies but few or no covers, which creates the suspicion that all the “used” copies may actually be CTO. In this situation, it is worth while spending a bit of time on forensic approaches which may help determine whether a loose stamp is CTO or postally used. Consider a simple example. 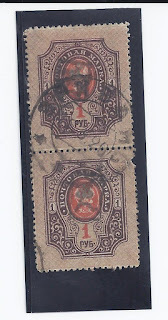 Below is a pair of fairly common Armenian stamps with ERIVAN “b” 11 3 20 cancellation. This cancel is very common on CTO material and March 1920 is within the period for which we know there is CTO material. However, the CTO cancel was normally applied either to each stamp individually (“socked on the nose”) or applied in the centre of a block of four stamps, a very common CTO practice. But here the cancel is over two stamps. It is also not as clear as those normally seen on CTO material. Could this pair be postally used? If it is, we gain quite useful information – it suggests that Erivan post office was open on this date and that this stamp was available at the counter. Will anything settle the matter? Well, if we turn over the pair there is a very small amount of paper adhesion and, more importantly, the outline of what could be an envelope flap. So it seems possible that this pair sealed an envelope flap a common practice. My scan does not really help establish this, but I can make the point more clearly from a different item, the strip of three which follows. In the case of the strip of three, I originally thought this might be fiscally used. But the evidence on the back is that it is from a letter. 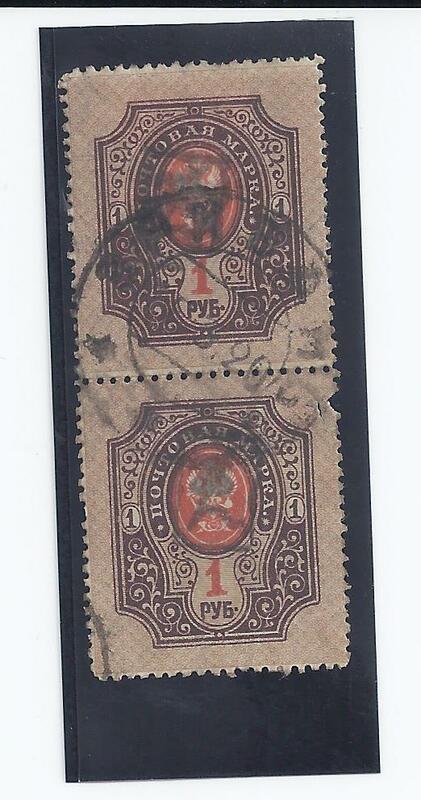 The small framed Z placed at top left of the stamp is an early style of overprint and so this strip could date from late 1919 or very early 1920 and from outside the two main cities, Erivan and Alexandropol. Beyond that I don’t want to speculate! But it gives every appearance of having been genuinely used to frank a letter. Part of the interest of these items is in the fact that they are from an old English collection with some internal evidence that the collector got material from either Tchilingirian or Ashford.